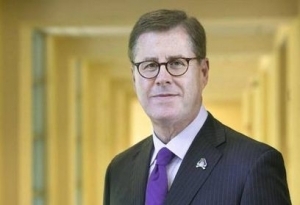 In May, Policy Watch dove into the winding, controversial background of new East Carolina University Chancellor Cecil Staton. Staton was one of the first major university appointments under UNC System President Margaret Spellings. It was criticized by some who questioned hiring an individual with a lengthy political background in a primarily academic position. In our story, we explained how Staton, in addition to being an accomplished academic, former Georgia Republican legislator and right-wing book publisher, led a voter ID charge that passed in Georgia in 2005. That law is a model of sorts for similar voter ID legislation passed in GOP-controlled states such as North Carolina, despite the fact that civil rights groups and Democrats have blasted such bills as an attempt to blunt voting among the youth and the elderly, two groups that tend to vote for Democrats. We also reported on his bizarre involvement in a 2011 email scandal—in which he was accused of lambasting his political enemies under a fictitious name—that led him to temporarily step down as majority whip in the Georgia state Senate. Now, an East Carolina student’s documenting of her online interaction with Staton, who took over the job this month, is making the rounds on social media. 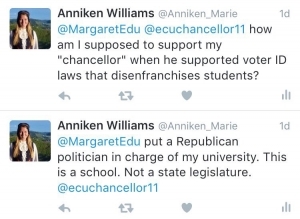 According to student Anniken Marie Williams’ posting on Medium, the new chancellor (or whoever manages his Twitter feed) blocked her from following his account after she publicly criticized his stance on voter ID on Twitter. Williams is a senior political science and international studies major affiliated with the school’s College Democrats group. It is common knowledge that the voter ID laws we now have in North Carolina, similar to those Staton supported in Georgia, disenfranchise minorities and college students. I am a believer in equality, and I have been fighting this entire summer for fair voter rights. It was a little disturbing to me to know that our new chancellor supports a law that puts our students at a disadvantage. So I voiced my opinion. These are not aggressive or threatening tweets. These are legitimate concerns that I know many of my fellow students and friends from across the state have. I figured these tweets would be ignored by both Spellings and Staton. Spellings did just that, but Staton did something very different. He blocked me. 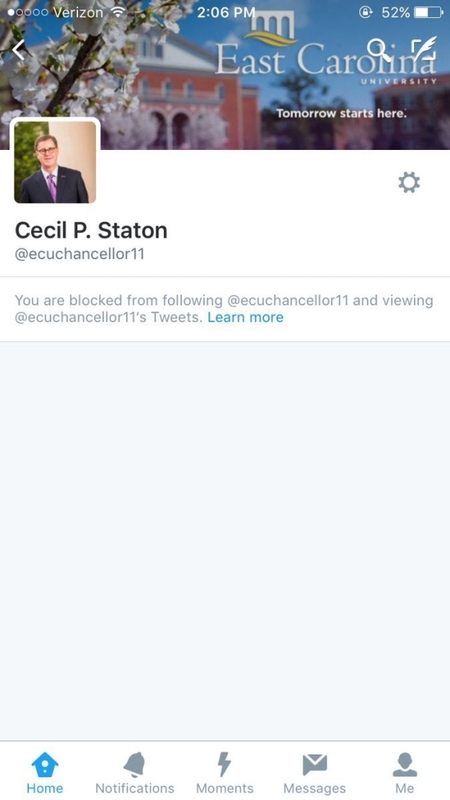 A man who is chancellor of a higher education facility blocked one of his students on the first day of his job. Instead of reaching out and trying to offer an explanation or positive sentiments, he reacted in a way that is similar to a teenager who gets their feelings hurt over a Twitter argument. I expected a man who gets paid $450,000 to listen to his students instead of blocking out their voices. I am a proud ECU Pirate, but today I am disappointed in our university. I am fearful for the future of our education system under Spellings and Staton who are #alreadysilencingstudents. Policy Watch spoke to Williams Thursday morning, and she tells us that, since her Medium post was spread online, Staton has since removed the Twitter block. The chancellor has also agreed to sit down with Williams and members of the College Democrats for a meeting Friday, she said. Nevertheless, Williams told Policy Watch she’s concerned about the online flap. Williams said she hopes Friday’s meeting will remain “professional,” and she hopes to get some answers to her concerns about how his political background will impact his leadership at ECU. Staton could not be reached immediately for an interview by Policy Watch Thursday, but, in a profile feature with The Daily Reflector in Greenville today, he addressed the issue. Instead, he wants to use social media as a way to promote the university. Staton was hired by the UNC System Board of Governors, upon Spellings’ recommendation, with a $450,000 annual salary, a major raise from his predecessor, former ECU Chancellor Steve Ballard, who earned about $322,000 annually. Before ECU, Cecil was at Valdosta State in Georgia. He fired over 30 faculty within days of arriving. These were young tenure people that were starting families and buying houses. These were in areas like math and science and people that were filling classes. He turned around and hired people to play in the orchestra, etc. He fired people so he could free up money for his own projects, to make himself look good.